100 degree days in Prescott are not the time to find out your air conditioner is slacking. 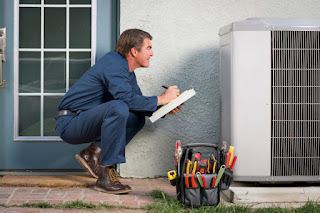 Prescott Air Conditioning suggests regular maintenance to extend the life and efficiency of your Prescott home's air conditioning unit. In addition, here are some other ways to preserve your unit. Running an air conditioner continuously is a quick way to wear it out. During times when no one is home, either turn it off or turn the thermostat at least five degrees warmer to extend the unit’s life. Your air conditioner needs to be cleaned on a regular basis. Removing the dust, dirt, debris and leaves will help your air conditioner to work at its optimum. A clean unit reduces the risk of a potentially expensive mechanical breakdown. Getting regular tune ups is very important to the overall life expectancy of the unit by preventing problems before they begin. A good time to schedule a tune up is right before the hot summer months begin. If there are any obstructions to the air vents in your home, it is important to remove them so that air can pass easily. This way the unit does not have to work as hard to circulate cool air throughout your home. If dirt and debris build up inside your home's air ducts, it can make it difficult for cold air to pass through. Clean air ducts will also contribute to improved air quality and even reduce the amount of dust in your home! Changing the air filters in your air conditioning unit will extend the lifespan of your unit, improve the unit's overall efficiency, and reduce energy costs, saving you money.